AMERICAN WELDQUIP wire conduit offering are designed for low drag and exceptional wear characteristics. Our line up of wire conduit offers you a wide selection for various applications. All are specifically designed to provide maximum performance. We also offer Dura-Domes for round and square wire feed drums and well as other accessories including conduit connectors, wire straighteners and the Easy Balance conduit hangers. With robotics continuing to push the wire feeding envelop the requirements for exceptional wire feedability options are ever demanding. American Weldquip offers a wide variety of options to meet these requirements. 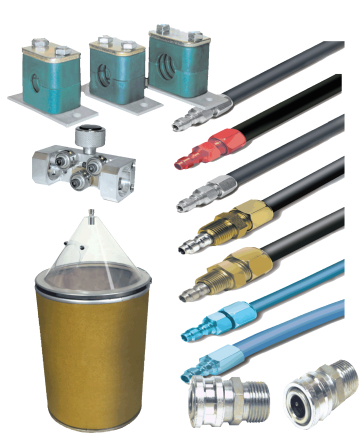 From a wide selection of high quality wire conduits to guarantee problem free wire feeding, to the necessary connectors, conduit clamp, wire drum hoods, wire straighteners and cable counter balancers we have it all. These polymer based conduits provide easy installation, superior feeding due to the low drag characteristics, exceptional long life and less wire contamination. These proven, durable conduits have been used to replace metal type liner systems due to their lubricity. The QCC and QCC-HD wire conduits are constructed to withstand the continuous flexing associated with today’s automatic or semi-automatic applications. These conduits are excellent for many “push” systems where electrode is pushed from the feeder to the welding head. They will not stretch or compress, and are electrically insulated. The QCC-R is an extremely flexible conduit which combines the reliability of a steel monocoil with the flexibility of an unreinforced conduit system. It is ideal for applications where a tight bend is necessary, such as in the interior of an articulating arm and confined booms. They have limited stretch and are electrically insulated. The ERC and ERC-HD conduits resist wear and reduce feed pressure due to their limited bending. These conduits are designed for extended run lengths. Ideal for stationary applications, they will not stretch or compress, and are electrically insulated. contaminants while providing an economical payout of your welding electrode. The impact-resistant clear plastic cover allows “At a Glance” inspection of the electrode with a full 360 degree view. Dura-Domes are designed for use on popular carton/drum sizes world-wide and have a clear access/inspection flap that allows access and viewing of the electrode without removing the dome. Also available is a precision formed Black PE Dura-Dome constructed of high density Polyethylene plastic that resists cracking and breakage for extended service life. A clear access/inspection flap is provided to view the electrode. Conduit, Wire Feeder and Pay Out Connectors are quickly and easily installed to any of our wire conduit products. The connectors are designed as to not interfere with the welding wire. You are assured of effortless wire feeding characteristics eliminating downtime, lower operating costs and improved bottom line. electrode for better “wire to tip” contact. in any location. Join two or more strengtheners together for greater effect. Compact and lightweight. 1/8″ (3.2mm) diameter. Requires adaptors for quick disconnect set up. * Secures Conduits, limiting movement and abrasion. 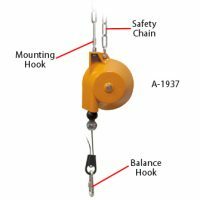 * Reduces Flexing and Fatigue at connections; distributes load. * Retains conduit position for Faster Wire Changes. * Electrically isolates conduit and allows precise mounting. * Zero Gravity Effect with constant balance through the cycle. Not a spring retractor. * Reduces Stress on associated equipment. * Prevents Kinking of conduit. * Retracts To The Same Position without over travel. * Long 4′ (1.2m) Retract Range. * Handles Most Applications with a 2.5lbs. (1.1kg) load capacity.